Are you smarter than the average person? Each year the toxic burden in our air, food and water – and thus our bodies – grows higher than ever before. Companies manufacture 6.5 trillion pounds of 9,000 different chemicals each year. That’s an almost incomprehensible amount. But to put it in perspective, an ocean supertanker carries about 3.25 billion tons. It would take 10,000 supertankers to carry the amount of chemicals that are manufactured in a single year. An increasing amount of evidence has linked exposure to toxins with both obesity and diabetes. Toxins cause inflammation and immune dysregulation. And as you know from reading this series, obesity and diabetes are autoimmune, inflammatory diseases. Comment: For more information, or if you wish to discuss this topic, please visit our diet and health forum. As one might expect, the process of neurogenesis is controlled by our DNA. A specific gene codes for the production of a protein, brain-derived neurotrophic factor (BDNF) which plays a key role in creating new neurons. Studies reveal decreased BDNF in Alzheimer’s patients, as well as in a variety of neurological conditions including epilepsy, depression, schizophrenia and obsessive-compulsive disorder. With this understanding of the relationship of BDNF to exercise, researchers in a report in the Journal of the American Medical Association, entitled “Effect of Physical Activity in Cognitive Function in Older Adults at Risk for Alzheimer’s Disease,” found that elderly individuals engaged in regular physical exercise for a 24-week period had an improvement of an astounding 1,800 percent on measures of memory, language ability, attention and other important cognitive functions compared to an age-matched group not involved in the exercise program. In January, 2009, the Proceedings of the National Academy of Science published a study entitled “Caloric Restriction Improves Memory in Elderly Humans.” In this study, German researchers imposed a 30 percent calorie reduction on the diets of elderly individuals and compared their memory function with a similar age group who basically ate whatever they wanted. At the conclusion of the three-month study, those who ate without restriction experienced a small, but clearly defined decline in memory function, while memory function in the group consuming the calorie-reduced diet actually increased, and fairly profoundly. In recognition of the obvious limitations of current pharmaceutical approaches to brain health, the authors concluded, “The present findings may help to develop new prevention and treatment strategies for maintaining cognitive health into old age.” What a concept. Preventive medicine for the brain. Because curcumin, the main active ingredient in the spice turmeric, increases BDNF, it has attracted the interest of neuroscientists around the world. Interestingly, in evaluating villages in India where turmeric is used in abundance in curried recipes, epidemiological studies have found that Alzheimer’s disease is only about 25 percent as common as in the U.S. There is little doubt that the positive effects of enhanced BDNF production on brain neurons is at least part of the reason why those consuming curcumin are so resistant to this brain disorder. Harnessing the expression of our DNA is empowering, and the tools to better brain health are available to us all — right now! Alzheimer’s & Dementia: The Journal of the Alzheimer’s Association, July 2009 (Vol. 5, Issue 4, Supplement, Page P84). We think we know what to eat: less red meat and more fiber, less saturated fat and more fruit and veg, right? Wrong, according to a controversial new book by obesity researcher and nutritionist Zoe Harcombe. In The Obesity Epidemic: What Caused It? How Can We Stop It? Harcombe charts her meticulous journey of research into studies that underpin dietary advice – and her myth-busting conclusions are startling. Ditch conventional diet advice: Zoe Harcombe says vitamins and minerals in meat are better than those in fruit. According to Zoe Harcombe, the obesity epidemic has less to do with our lifestyles than with what we are eating. ‘The key thing that people don’t realize is that throughout history, right until the Seventies, obesity levels never went above 2 per cent of the population in the UK,” she says. Yet by the turn of the millennium, obesity levels were 25 per cent. What happened? In 1983, the government changed its diet advice. After that, if you look at the graphs, you can see obesity rates taking off like an airplane. You might feel it is coincidence, but to me it is blindingly obvious. The older dietary advice was simple; foods based on flour and grains were fattening, and sweet foods were most fattening of all. Mum and Granny told us to eat liver, eggs, sardines and to put butter on our vegetables. The new advice was ‘base your meals on starchy foods’ – the things that we used to know made us fat (rice, pasta, potatoes and bread). That’s a U-turn. We’ve been told that carbohydrates such as rice, pasta, bread and potatoes should form the bulk of what we eat. The trouble with this, says Zoe Harcombe, is that as carbs are digested, they are broken down into glucose. This process makes your body produce insulin, in order to deal with the extra glucose. One of insulin’s main roles in the body is fat storage, so whenever you eat carbs, you are switching on your body’s fat-storing mechanism. Whatever carbs you don’t use up as energy will be quickly stored away in the body as fat. We should get back to doing as nature intended and eat real, unprocessed food, starting with meat, fish, eggs, vegetables and salads. “If only it were that simple,” says Harcombe. People think that if they cut out 500 calories a day, they will lose 1lb a week. They might at first, but then the body will recognize that it is in a state of starvation and turn down its systems to conserve energy. ‘So you may be putting fewer calories in, but at the same time you will be using up fewer calories to get through the day. Don’t over do it: Too much exercise could make you hungry so you eat more. This is standard wisdom: “exercise, we think, will burn calories, lose fat and speed up our metabolism. Think again,” says Harcombe. If you push yourself into doing extra exercise, it will be counterproductive because you will get hungry – your body will be craving carbohydrate to replenish its lost stores. If you are trying to control weight, it is so much easier to control what you put into your mouth. Not how much, but what. Then it doesn’t matter what you do or don’t do by way of exercise. “Real fat is not bad for us,” says Harcombe. “It’s man-made fats we should be demonizing.” Why do we have this idea that meat is full of saturated fat? In a 100g pork chop, there is 2.3g of unsaturated fat and 1.5g of saturated fat. Fat is essential for every cell in the body. In Britain [according to the Family Food Survey of 2008], we are deficient in the fat-soluble vitamins A, D and E, which are responsible for healthy eyesight, bone strength, mental health, cancer and blood vessel protection and, therefore, heart health. We need to eat real fat in order for these vital vitamins to be absorbed into the body. Controversially, Harcombe does not consider ‘high’ cholesterol levels a bad thing! ‘To pick a number – 5 (mmol/l) – and to say everyone should have cholesterol levels no higher than this is like declaring the average height should be 5ft 4in and not 5ft 9in and medicating everyone who doesn’t reach this meaningless number to reduce their height. It really is that horrific. Ancel Keys, who studied cholesterol extensively in the Fifties, said categorically that cholesterol in food does not have any impact on cholesterol in the blood. What is abnormal is the amount of carbohydrate we eat, especially refined carbohydrate, and this has been shown to determine triglyceride levels – the part of the cholesterol reading your GP may be most concerned about. It’s the ultimate irony. We only told people to eat carbs because we demonized fat and, having picked the wrong villain, we are making things worse. For three decades, we have crammed fiber into our bodies to help us feel full and keep our digestive systems moving. This is not a good idea, says Harcombe. The advice to eat more fiber is put forward along with the theory that we need to flush out our digestive systems. But essential minerals are absorbed from food while it is in the intestines, so why do we want to flush everything out? Concentrate on not putting bad foods in. Avoid fruit to lose weight: The sugar in them will be stored as fat. “Five-a-day is the most well-known piece of nutritional advice,” says Harcombe.” You’d think it was based on firm evidence of health benefit. Think again! 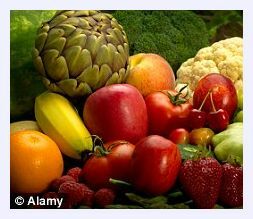 Five-a-day started as a marketing campaign by 25 fruit and veg companies and the American National Cancer Institute in 1991. There was no evidence for any cancer benefit. Apparently not. Harcombe allows that vegetables are a great addition to the diet – if served in butter to deliver the fat-soluble vitamins they contain – but ­fructose, the fruit sugar in fruit, goes straight to the liver and is stored as fat. the organizations we turn to for advice on food are sponsored by the food industry. The British Dietetic Association (BDA), whose members have a monopoly on delivering Department of Health and NHS dietary advice, is sponsored by Danone, the yogurt people, and Abbott Nutrition, which manufactures infant formula and energy bars. The British Nutrition Foundation, founded in 1967 to ‘deliver authoritative, evidence-based information on food and nutrition in the context of health and lifestyle’, has among its ‘sustaining members’ British Sugar plc, Cadbury, Coca-Cola, J Sainsbury PLC and Kraft Foods. ‘When the food and drink industry is so actively embracing public health advice, isn’t it time to wonder how healthy that advice can be?’ says Harcombe.